If you don’t use video for business these days you are missing out as search engines are hooking up to video content in a big way, boosting your search rankings.Video content is vital for conveying your key marketing, training and PR messages and reaching your customers on social networks. Your customers and prospects will always stay longer on your website where there is video content. Marketing and promotional videos for business are a great way to promote your brand virally through social media websites such as Facebook, Linked in & YouTube as well as at exhibitions and reception areas. You can show a worldwide audience your latest products and services either online or in-store videos. Now in addition to filming and editing your very own showcase, Wizard can help to SEO your videos. Over the years we’ve produced videos to promote all manner of things from oil tankers to beauty products and from dry cleaning to dog food. Tell a customer’s story on video, how they have benefited from using your company then the viewer can identify with the subject. 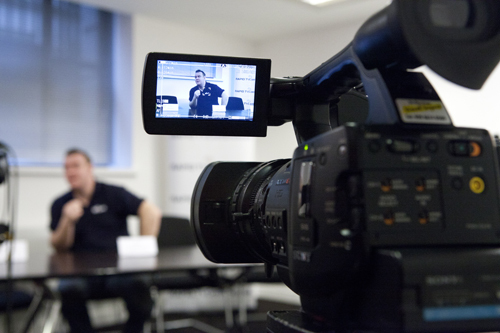 Filming and editing customer testimonials are always very powerful additions to your marketing strategy. Your prospective customers will love to hear a personal recommendation & endorsement from your existing clients. A testimonial video for business is far more powerful than a just a written quote. Double (or treble) the benefit of your latest conference or seminar! Want to build a great team by using video in your business? You don’t have to worry about the logistics of getting people together in one room at the same time. Edit your video in blocks then the viewers can take regular breaks and work at their own pace. A video can be interrupted, repeated and reviewed, and therefore, better understood. Your team will benefit from the consistency of the training message on video. Once you have started using video for business you will find so many uses and wonder how you managed before. on the very latest ways to use video to develop your business.